Help the 90s renowned artist Vinod Mangeshkar to repay his debts. Hello, I'm writing this to inform you about once a renowned artist Vinod Mangeshkar. Mangeshkar sir who lives near Mangir Baba Chowk, Dattawadi, Pune. Vinod Mangeshkar was born in Pune. He lost his parents when he was three years old in floods. So a Punjabi man from Delhi adopted Mangeshkar and took him to Delhi. He lived for more than 10 yrs in Delhi. Mangeshkar sir was an inborn artist. He began to draw portraits right from his childhood. When he was four years old, he made a portrait of Jawaharlal Nehru. Nehru appreciated his work and suggested him to draw a portrait of Queen Elizabeth. When Mangeshkar uncle came to his earning age, he thanked the man for taking his care and migrated to Mumbai to earn a livelihood. After just a few months of struggle, his talented was appreciated and he started designing sets for many Bollywood films. He had worked with Ramesh Sippy, Rajesh Khanna, Padmini Kolhapure, Jeetendra, Mumtaz and many more artists. He still recalls how he used to sit and enjoy breakfast with them in the sets canteen. He appreciates the ground to earth attitude of Rajesh Khanna and finds much difference between 70's artists and today's Bollywood actors. He also set a record for making the biggest painting of Lord Hanuman in just two days which became a part of the discussion in the newspaper. As he started growing older, the work started getting to decrease. Then Mangeshkar sir shifted to Pune. In Pune, he started to take small paintings order. At the age of 80, he had a major heart attack and had bypassed surgery. He has a loan of 4,20,000 Rupees which he took for bypass surgery. When he came to Pune he started living in slums until government provided him a 100 sq. ft room under slum redevelopment scheme. He recently made a portrait of business tycoon Ratan Tata. We recently visited his room and found all the paintings he made in that room. Mangeshkar sir is now 65 yrs old. He still believes in god during his dark days. He always says "To trust God in light is nothing, but trust him in the dark - that is faith". 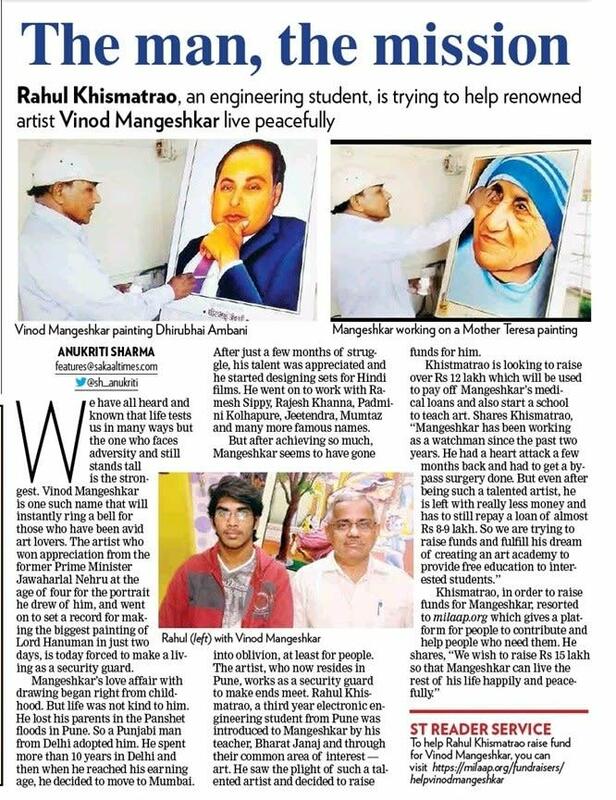 Vinod Mangeshkar's last wish is to set an academy where he can teach young generation free art and canvas painting. 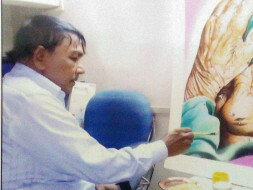 Let us contribute whatever we can to this artist to realize his small dreams and last wish in life. The funds collected from this fundraiser will go in repaying the debts of Vinod Mangeshkar which he had borrowed for his bypass heart surgery and rest of the funds will go for Vinod Mangeshkar Academy of Arts in Pune that will provide free arts education to young generation. Please donate as much as you can. Your small contribution will make rest life of this man happy who dedicated all his life to arts.